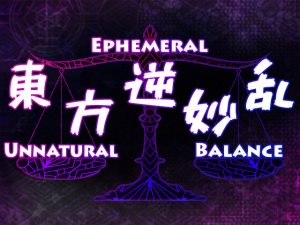 Ephemeral Unnatural Balance is the latest Danmakufu project by Ephemeral Entertainment. The initial idea was to make a game that starred many of the midboss-only characters from the main game series which evolved into a full Touhou fan game shmup, containing 6 stages and an extra stage. A stage 3 demo has been completed and released here. 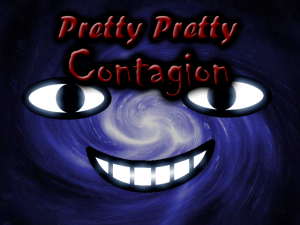 Pretty Pretty Contagion is a Danmakufu fan game centered around a popular meme of the Walfas Station Wagon Deviantart group. It tells the untold tale of the final battle of the Walfas comic series by MiniWitch3 by the same name. It stars the Pretty Pretty Pony, the bizarre creation of WSW veteran Spaztique. It contains one battle of approximately extra boss length, in addition to an unlockable last word. 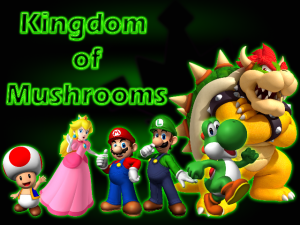 Kingdom of Mushrooms is a danmaku work-in-progress fan game that crosses over the Touhou and the Mario universes. Although significant progress on the game has been made, development of it entered a hiatus some time ago. A 3 stage trial of the game was released just prior to the hiatus. While stage 4 has been completed behind the scenes, I have yet to truly work on the rest of the stages. While I have no intention of abandoning the project completely, I’m not actively working on it at this time.